It can seem that your relationship with your child doesn’t truly begin until they can speak. However, a close observer will find dozens of ways that even the smallest babies communicate regularly. From the way they move their bodies to how they use their voice, the tiniest of humans can tell us a lot about themselves. Here are five different ways babies communicate with us when we pay attention. Clearly crying is communication. By did you know that a baby will have many different cries, each relaying a different emotion or need? As you get to know your baby, you will learn to distinguish his “I’m hungry” cry from the “naptime” whimpers. Crying is an excellent tool for babies since we parents are biologically wired to respond to it. While hours of crying can exhaust and frustrate us, remember that your baby doesn’t cry to annoy you. In fact, as their cries are happening to you, the discomfort is theirs as well. Responding when your baby cries creates a secure attachment and loving bond. While very young babies are not yet able to focus their eyes well, before long you will find your baby connecting her gaze to yours. Eye contact is another way that babies communicate, and it is delightful. Your baby will watch you intently as she eats or as you sing or read to her. Even from birth, your baby is absorbing the basics of verbal communication. That intent gaze is focused on capturing and understanding words. Returning her gaze and speaking to her clearly and often will help your baby’s brain make connections quickly. While baby makes eye contact to show you affection and to bond with you, the opposite response means something too. Babies look away from people or other stimuli when they are overwhelmed and need a mental break. As tempting as it may be to move back into your baby’s gaze, try to respect this simple desire for space. Remember, a baby cannot yet move herself physically away from you. If she is feeling overwhelmed, the only control she has is to avert her gaze or turn her head. Often, after a moment of recovery, she will be back with you and ready to play again. Somewhere in your infants first few months, he will find his voice. At first, he will use it as a toy, experimenting and seeing what will happen. Before long, however, he will learn to use it to mimic you. You will hear many different noises in his babbles, but often the best parts of these “conversations” are the facial expressions that babies include. 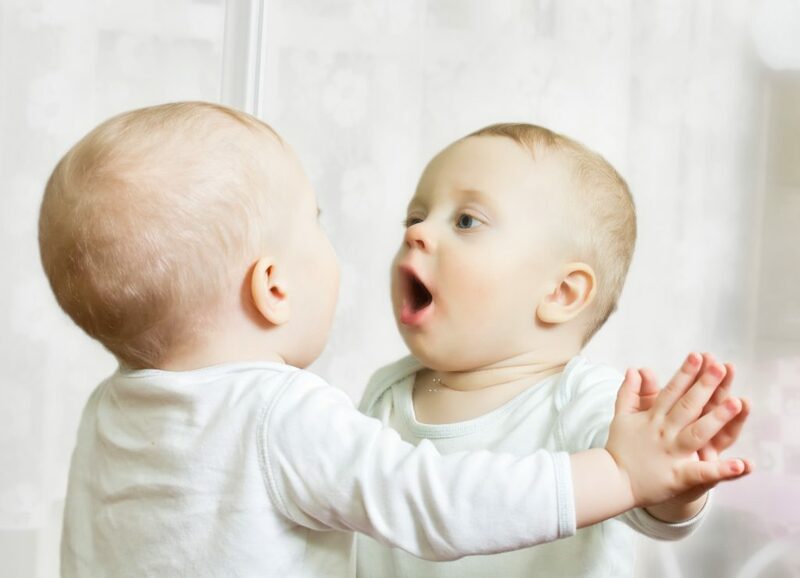 While babbling rarely includes many real words in a baby’s first year, that doesn’t mean it isn’t part of how babies communicate. In fact, babies will simulate a conversation with you as you respond to their babbles, speaking back and forth in turn. It may be tempting to babble back at the baby, but the best way to help him develop is to speak to him slowly and clearly. We have clearly saved the best for last. There are few things more joyful or endearing as a baby’s smile. Babies communicate many things with their smiles. Often a baby smiles to show familiarity and good feelings. This can be true for you, her parents, but it may also be true for siblings, other caregivers, or even the family pet! Smiles also show delight and entertainment. Babies will smile at favorite toys, songs, and noises, and even ceiling fans! Everyone loves to make a baby smile, and often babies are glad to share them. It’s a rewarding feeling to communicate with your baby and receive a smile in return. Babies communicate in so many small and enjoyable ways. With some careful attention, you will soon notice the variety and intricacy of their own special language. Are you looking for childcare in a place where the caregivers will show the same attention and care that you do? If so, take a moment to visit Legacy Academy Suwanee Dam. We treat every child with the utmost respect and look forward to meeting your little one soon.